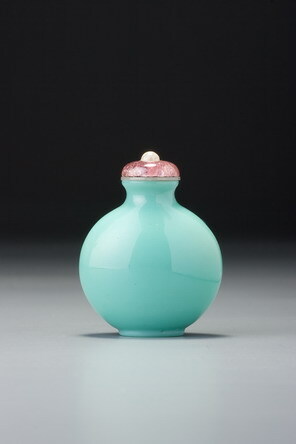 Although no specific mention of turquoise coloured glass has come to light prior to the Yongzheng period, we may safely assume it to have been one of the colours which could have been made at court and elsewhere, from the beginning of the Qing glass renaissance. Bright turquoise-blue glass was readily available in China even before the Jesuits set up the Imperial glassworks. Like so many plain glass bottles, there is a high probability it originates from the Imperial glassworks, and may date from as early as the Yongzheng period. 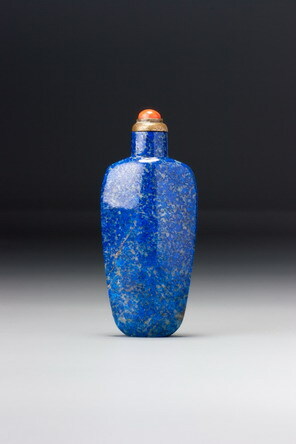 The Susan Ault Collection includes a Yongzheng-marked turquoise bottle of a vaguely related form (Gerard Tsang and Hugh Moss, Snuff Bottles of the Ch’ing Dynasty, Hong Kong Museum of Art, 1978, no. 38). The colour of the glass here is identical to that of Sale 4, lot 68, which is also convincingly early as a form. The concave lip on this example is not the standard for glass bottles, of which the majority are flat, and it may have been a later embellishment. In the 1960s and thereafter, the concave lip came to be viewed as a sign of fine workmanship in hardstone carvings (whereas it is in reality no more than an indication of an artistic choice involving minor amount of extra trouble). The polish on the lip is slightly at variance with that of the rest of the bottle, and it seems likely that someone responded to the hardstone criterion of the day and added this detail to a glass bottle.